President Vladimir Putin made Russia’s message loud and clear at this year’s Gas Exporting Countries summit: The members need to resist increasing pressure from gas consuming countries and keep sticking to the basic principles of long – term contracts. Moscow played host to The Gas Exporting Countries Forum (GECF), and speaking at the summit, Putin said that growing pressure on gas exporting countries was a serious challenge. “The pressure on exporting countries is growing. I see this as a serious challenge for all of us. First and foremost, this is an attempt to dictate economically unacceptable terms for producers on deliveries of pipeline gas, the desire to alter the principles for gas deliveries that are the basis of long-term contracts, cutting the contract price free from the price of oil and oil products as market and price indicators, lowering the level of gas volumes that must be taken up,” Putin said. “I'm talking above all about changes in European Union energy regulation and law, the so-called Third Energy Package. The enactment of this gas directive seriously restricts the activity of traditional gas suppliers to the EU market,” Putin clarified. The Third Energy Package was tailored by the Euro Commission “to increase competition in a European energy market.” In particular, it calls energy companies operating in Europe to split their upstream operations and production assets from the infrastructure, handing over the latter to some independent companies. Russia says the increase in the number of companies operating in the market creates extra charges and reduces the opportunity to attract investment. The summit attendees agreed they needed closer cooperation to avoid a dictate by gas consumers. “To finance large – scale projects throughout the whole production chain, we need to keep the link of gas prices to the prices for oil and oil products. Only this way we can achieve fair prices, the ones in the interest of the countries that have gas deposits. And we, given our economic power, can achieve that,” said Venezuelan President Nicolás Maduro. Russian state-owned companies have a long history with long-term contracts and fixed prices, a growing complaint among their European clients, who feel ‘overcharged’. European have launched, and won, a number of arbitration cases against Gazprom, Russia’s biggest and highest-valued company. On Thursday, Germany’s RWE won $1.3 billion in compensation in a dispute over pricing mechanisms for long-term gas-supply deals in arbitration against Gazprom. Other companies have won similar ‘take-or-pay’ cases in which courts ruled the importing country didn’t have to pay for unused gas. 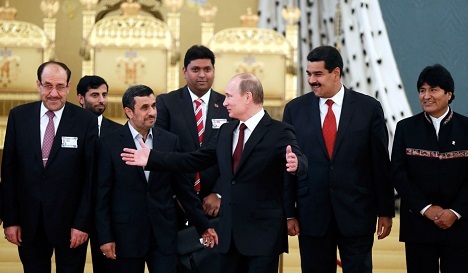 Gathered at the Kremlin for the GECF are 13 member states and four observer members, who collectively control over 70 percent of the world’s natural gas reserves, 85 percent of LNG production, and 38 percent of pipeline trade. The GECF was founded in 2001 in Tehran, and was legally established back in 2008 in Moscow. Its members are Algeria, Bolivia, Egypt, Equatorial Guinea, Iran, Libya, Nigeria, Oman, Qatar, Russia, Trinidad and Tobago and United Arab Emirates. Venezuela. Kazakhstan, Iraq, the Netherlands, and Norway all have observer status. President Putin has urged Russian energy companies to ‘rise to the challenge’ of the shale revolution, as the discovery of shale reserves in America has offset traditional exporting countries gas and oil revenues.